I’m not really into politics, however it appears that the Good ‘ol U. S. of A. is going to have it’s first African American President. Now while that is of itself a noteworthy and landmark occurrence, as the transition from slavery to presidency is no mean feat, I’m also hoping it will bring with it important changes. Like an improved economy. Reduced national deficits. Better international relationships. You know. Good Presidential stuff. Is that not completely and uncompromisingly awesome? Now this is a weapon for which a Gun Kata would make practical sense. Yes, A Gun Kata. You know, that little gun dance that seemed to occur at random in the movie “Equilbrium”? The one with Christian Bale before he became the “Dark Knight? Yeah. That one. Go look up Gun Kata (not Katar) on the YouTubes or something. But I’m ranting here. Back to Gun Katar goodness. 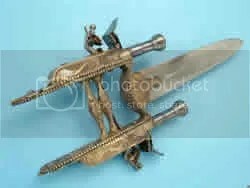 What you are looking at here is a Katar, a traditional Indian punch dagger, primarily a thrusting weapon, often designed to penetrate chain mail armored opponents. 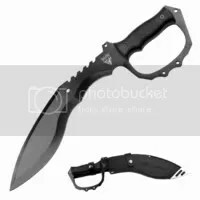 It has a thick wedge shaped blade, and unlike most other weapons, the blade is held vertically, by a grip and a set of side bars that sit at right angles to the blade. 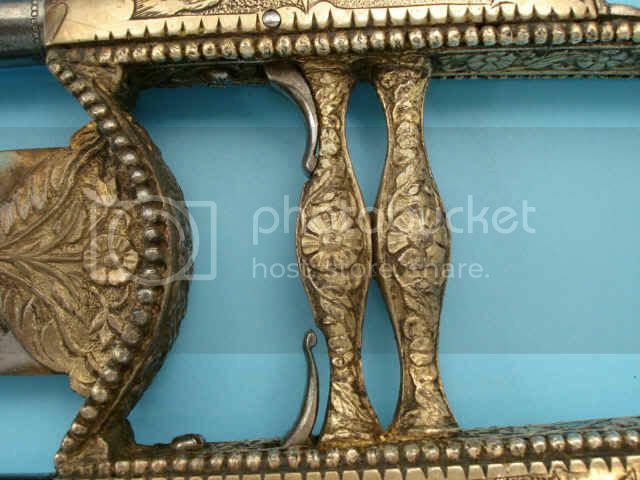 This one is a particularly ornate one, featuring some very intricate engravings. 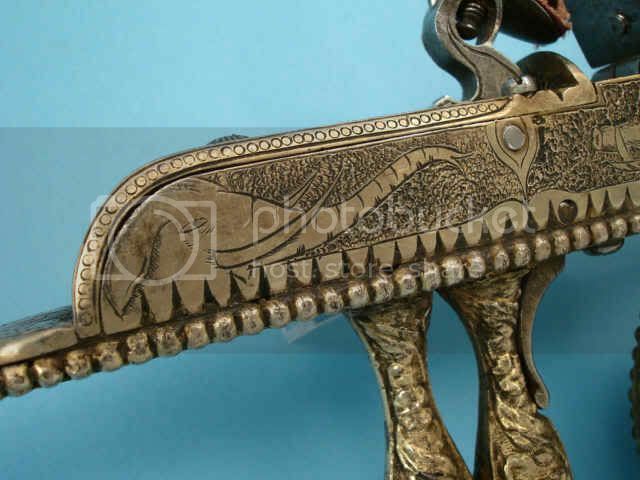 You can see an elephant and a boar on one side, as well as flowers, leaves in the center area where the blade emerges, and other traditional Indian adornments. Like many other katar, this features a double bar center grip, with the traditional side bars that run down either side of the blade and acts as guard as well as added support for the weapon. This Katar is sporting a pair of flint lock pistols, one attached to either side of the weapon. If you look closely at the grip, you can see a pair of triggers recessed into the front bar, one at the top and one at the bottom. 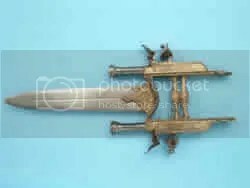 As you can probably imagine, a person wielding this in battle would have a healthy advantage over your poorly equipped standard Katar wielding schlub. 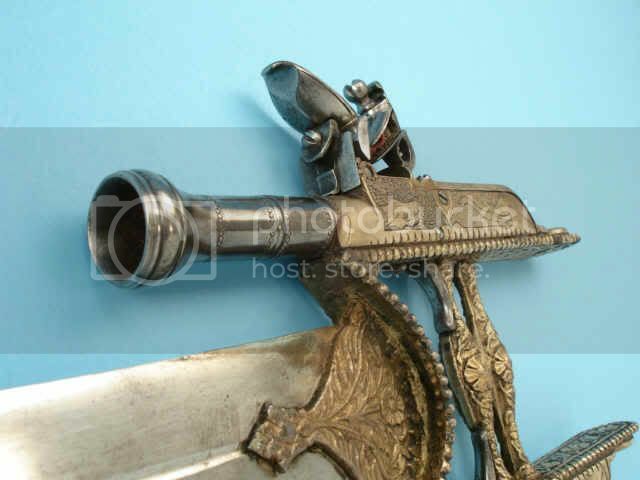 I can just imagine how confrontations with the original owner of this weapon would have ended. Indiana Jones style. 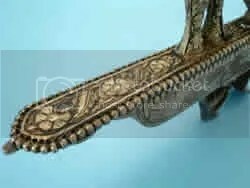 A while back, I had a reader ask for some information on Mughal period weaponry. Not knowing too much about it, I did some reading up and found that the Mughal period was a historic period in India that ran roughly from the 16th to 19th Century, where a large portion of the Indian subcontinent of Asia was ruled by Islamic Imperialists. However I also quickly discovered that the Mughal period covered waaaay too much time and encompassed a large a geographical area that sported too many different but entirely indigenous weapon designs for me to single any specific one out. So due to my rather dwindling time resources, I wasn’t able to be much help (for which I apologize). This sword features a damascus blade that starts out fairly straight, but curves mildly towards the tip into a rather wicked looking point. The spine of the sword follows suit, except for the top third, which looks a lot like it was cut down from a much larger, wider deeply curved scimitar. 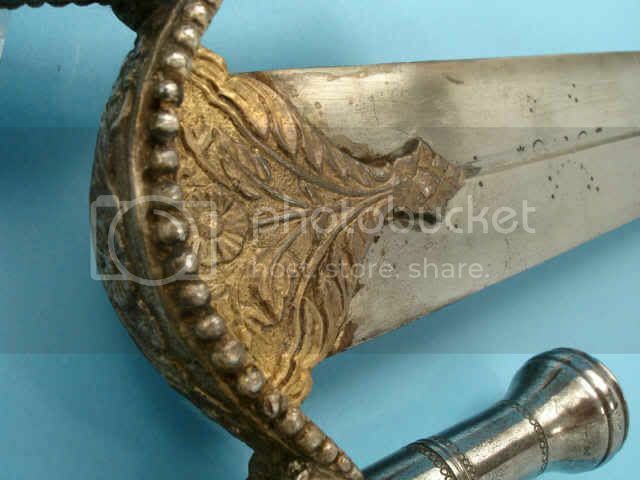 The hilt is also unusual for a Persian blade, featuring no cross guard, and almost straight grip, but a reverse curving pommel, molded into the head of a stallion. Overall an interesting (if a little perplexing) study in Persian weapon design. This blade is an interesting mix of flavors, part scimitar, part broadsword, with an unusual hilt design. The weapon, as a whole seems to match little of the historical weapon patterns of the area that I’m aware of, but instead seems to be a variation of a mix of different Persian weapon styles that have themselves been modified. As an example of Mughal style weaponry, I must admit to being a bit flummoxed by the design. Most of the authentic historical weapons I came across when I was doing my initial research on the topic, bore significant differences in design. In the comments of the post before last, I was asked by a friend what kind of sword I would pick for personal defense/offense were the world to be suddenly plunged into a post apocalyptic state where firearms no longer worked. My answer? : A Japanese Katana. However it was a rather incomplete answer. In reality, I would not be limited to 1 weapon, and even if we retained the artificial “no firearms” limitation there would still be quite a number of considerations that would go into how many weapons I would carry and which ones. It is a topic I think worthy of a dedicated post. Interestingly, the Khukuri has made an appearance in other post apocalyptic movies, such as “Cyborg” (one of Jean Claude Van Damme’s characters favorite weapons) and “Waterworld” (Kevin Costners “Mariner” used one to rather terminal effect). 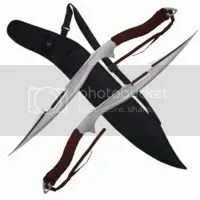 Now while the movies are a great (but sometimes unrealistic) showcase for the Khukuris flexibility, there are actually a lot of good real world reasons why a Khukuri would be a great blade to have as part of your arsenal in a post apocalyptic world. Notice the sharp point, the knuckle guard, the saw back spine? Most of these features you’d find on your average survival knife. But here they are in Khukuri form. And its all black! Ha! Now this is a Khukuri I’d love to have, come the apocalypse!! If you are a fan of the X-Men comic book series, saturday morning cartoons or movies, you’ll probably be aware of the kind of cool things that a mutant can do. Obviously this isn’t a comic book blog, so no, I’m not posting about X-Men. Unless one of them happens to have a cool sword that some knife designer decides to produce. Yup, yup. It’s a mutant. Trust me. What was it before it’s x-gene was activated? I’ll tell you. It was a Khukuri. What’s a Khukuri? Ah, well let’s take a trip into the history of British Nepal and India. 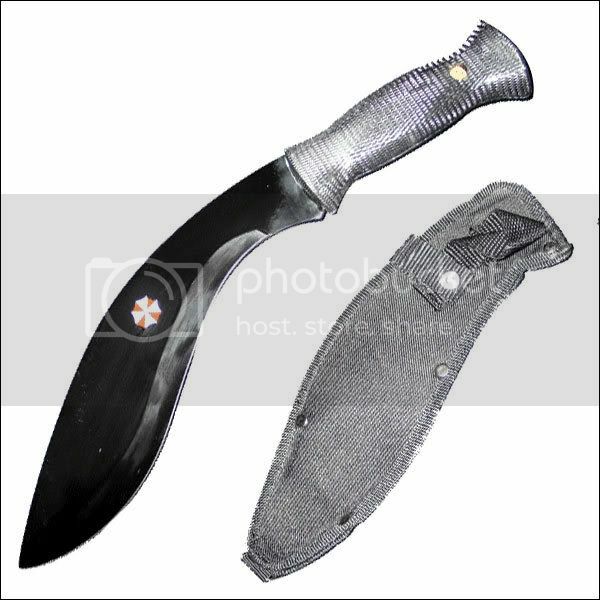 The Khukuri is a traditional knife used by the Gurkhas of Nepal and Northern India. The Gurkhas were recruited by the british army for their bravery, resilience and strength, and each Gurkha soldier carried with him a Khukuri knife. Eventually this unique knife became known as the Gurkha knife, aka the Gurkha Khukuri. Above is a traditional Gurkha Khukuri. If you ever watched WaterWorld with Kevin Costner, who played the role of the Mariner, (who was coincidentally, also a mutant), this is the knife he used to dispatch a rather unruly seafarer during the movie. 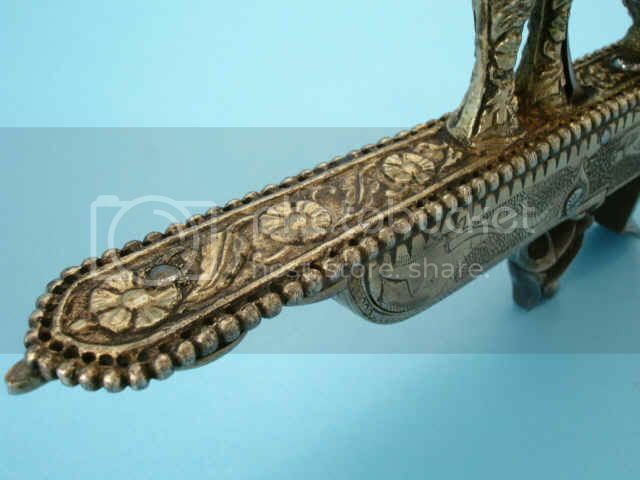 Now the Khukuri above has been polished to a mirror shine, which is not typical. But I”ll bet you can see a resemblance to it’s mutant form? See it? Huh? I thought so. Now given that the Khukuri is a fairly lethal weapon in it’s own right, it makes all kind of sense for there knife makers to produce several variants of this blade design, some of which I will probably blog about in the near future. However, this fantasy design really caught my eye. 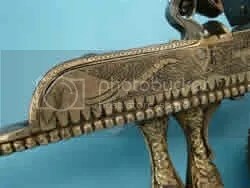 As you can see, this mutant Khukuri carries the basic shape of a Khukuri, with several modifications. It is longer, with a narrower blade with in proportion to the original. The fantasy design also eschews a wood or horn grip for a full tang cord wrap. Also there is a divot in the spine of the mutant with a short connecting bar, also sporting a cord wrap. This I’m not too happy with, as it introduces a structural weakness into the blade that is really unnecessary. But that is my only major gripe. The fine point sweeps down to a rearward hook just before the aforementioned divot, which is a nice touch. And the cord wrapped handle and integrated finger guard is equally interesting, conforming to a mild s-shape, probably intended to perform the same function as the sharp, 20-degree dogleg in the blade of the original Khukuri was designed for, which is to make the chopping edge meet the target as flat as possible without the need to bend the wrist. This makes for a much more powerful chopping stroke. In addition to this, the fine point and s-shaped grip could actually allow this to be used as a decent stabbing weapon, which is an ability that the original Khukuri was severely lacking.